It's the season of resolutions- New Year's Resolutions that is! All around, people are taking a long look at their life and setting the goals they hope to accomplish in the new year. And for many, those well thought out goals that seemed like a good idea at the end of they year fall to the side by February. Believe me, I've been there too! But that's not ALL New Year's resolutions. In fact, back in my junior year of high school, I made a rather interesting resolution that not only did I keep, but one that affects me still today: I resolved to go one whole year listening to nothing but Christian music. Now, I must admit when I made this resolution, people around me thought I was rather crazy. I was already a slight Christian music fan at that point, but my music collection varied from oldies to pop to country... I loved music, and I loved having a wide variety to choose from. Still, as a newly baptized Christian, this was something I felt strongly about, and despite the naysayers, I went for it. Not only did I make it through that whole year listening only to Christian music, I actually continued well beyond that first year. I did gradually reintroduce a larger variety of music, but even now 10 years later you will find that my music collection consists primarily of Christian hits. I love the difference it makes in my attitude and my relationship with God. (And I love knowing that my kids can listen to it WITH me, without fear of them hearing things they should not!) It truly is astounding the impact something as simple as our choice in music can make. Experience the concert of a lifetime and celebrate the impact of contemporary Christian music from around the world over the past 40 years. This huge compilation album features some of the top songs from the top artists of the past four decades. Some of the artists featured are Steven Curtis Chapman, Michael W. Smith, Amy Grant, and many more. This DVD includes live performances of top Christian contemporary songs. Can I simply just say...how awesome is this? Though I love the newer contemporary Christian music too, I have to admit that some of these older Christian hits hold a very special place in my heart. These are the songs that introduced me to Christian music, the songs that as a newer Christian drew me closer to God, the songs that held fond memories. Songs like Breathe and Indescribable took me back to the sanctuary at church camp- simply the most amazing worship services I've ever experienced where I first truly felt the presence of God. Songs like On My Knees and God of Wonders took me back to my old church, where I performed these same songs every Sunday before the congregation with one of my oldest and dearest friends and singing partner. This was a huge part of my life as a teenager- performing in church each week. And of course, I could not help but love those newer hits too like Free to Be Me and God's Not Dead. Throughout all these years, Christian music has only continued to get better and better and this DVD shows that beautifully. I would watch it again and again. My kids enjoy it too, and I love sharing some of those older hits with them that just aren't as commonly played on our radio station! 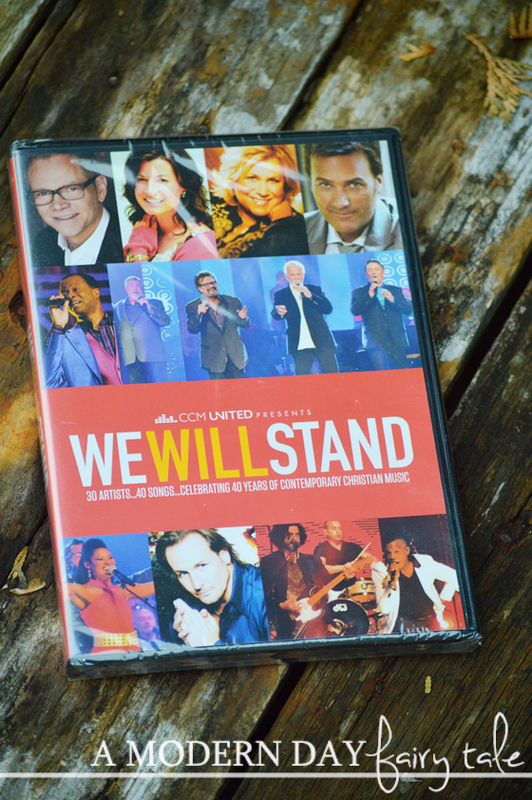 Whether you are a long time Christian music fan, or someone looking to change your relationship with God through music as I did so many years ago, the We Will Stand DVD is a must watch! Or if you'd prefer, you can buy the CD too! Both are available to purchase at Family Christian. Are you a Christian music fan? What are some of your all time favorite hits? How does Christian music impact your life and your relationship with God? So nice!! I love that it's like being at your own concert :) Too awesome!! Disappointed Rich Mullins didn't make it on there. At least two of his songs made it, though! Rich meant the world to me. I still miss him. I felt like he was the Steve Green of my generation. Not Steve Green...I'm thinking of someone else and now his name is escaping me. It was Keith Green. Does your cell phone have new ringtones? From the Imagination of Finley Grace, Age 2.